The New York Rangers travel to Air Canada Centre to play the Toronto Maple Leafs on Saturday, October 7, 2017. The opening line for this game has the Rangers at +110 and the Maple Leafs at -140. New York had a record of 48-28-6 last season and on the road they had a record of 27-12-2. They finished 4th in the Metropolitan Division. They scored 256 goals and gave up 220 goals for a point differential of +36. For the season they had an ATS record of 54-40-0 and an over/under record of 44-34-0. Toronto finished with a record of 40-27-15 including 21-13-7 at home last season. They were 4th in the Atlantic Division. They scored 251 goals and surrendered 242 for a goal differential of +9. Their record against the spread was 42-46-0 while their over/under record was 42-45-0. 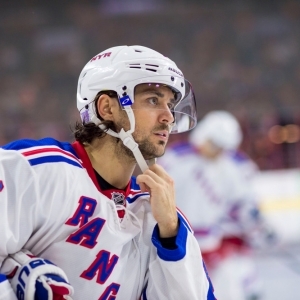 Mats Zuccarello accumulated 59 total points last season for the Rangers. He had 15 goals last year with 188 shots on goal giving him a shooting percentage of 8%. He had a total of 44 assists on the season and averaged 18.8 minutes played per game. Kevin Shattenkirk averaged 19.9 minutes of ice time per game last year. In that time he had a shooting percentage of 8% by scoring 12 goals on 156 shots. He had 43 assists giving him a total of 55 points on the season. Henrik Lundqvist had 31 wins and 20 losses last season in net for the Rangers. He had 1,650 shots against him and he gave up 148 goals. He made 1,502 saves for a save percentage of 91%. Mitch Marner scored 61 total points last year for the Maple Leafs. He had 19 goals last season with 173 shots on goal giving him a shooting percentage of 11%. He had a total of 42 assists on the season and averaged 16.8 minutes played per game. Auston Matthews averaged 17.6 minutes of ice time per game. In that time he had a shooting percentage of 14% by scoring 39 goals on 272 shots. He had 28 assists giving him a total of 67 points on the season. Frederik Andersen had 33 wins and 16 losses last year in goal for the Maple Leafs. He had 2,052 shots against him and he surrendered 169 goals. He made 1,883 saves for a save percentage of 92%. The Rangers had 102 total points last season, which ranked them 9th in the NHL. They were 4th in the league in goals scored with 256 while they gave up 220 goals, ranking them 18th overall. They had 232 power play opportunities and scored 47 goals on those chances for a percentage of 20%. That was 10th in the NHL. The Rangers allowed 224 power play opportunities and gave up 45 goals on those chances for a penalty kill percentage of 80%, putting them 19th in the league when short-handed. They averaged 30 shots per game and as a team shot 10.50% for the season. They allowed 30 shots to their opposition per contest and had a team save percentage of 91%. That put them 11th in the league in stopping the puck. The Maple Leafs were 14th in the NHL with a total of 95 points last year. They had 57 power play goals on 244 opportunities for a percentage of 23%. That ranked them 2nd in the league as a power play unit. They allowed 251 power play opportunities and gave up 44 goals on those chances for a penalty kill percentage of 82%. That was 10th in the NHL. As a team, the Maple Leafs were 5th in the league with 251 goals scored while they gave up 242 goals, which was 9th overall. They averaged 32 shots per contest and had a team shooting percentage of 9.59%. As a team they gave up 33 shots per game and had a save percentage of 91%. That was 13th in the NHL. New York was 23rd in the NHL in Corsi percentage last year with 49.1%, as they attempted 4,512 shots on net at full strength while they gave up 4,684 shots on net in the same situations. Their Fenwick percentage was 50% as they had 3,438 attempts while they gave up 3,440 shots on the defensive end. That ranked them 18th in the league. The Rangers started possessions in the offensive zone 50.4% of the time, which was 18th in the league, while their defensive zone percentage was at 49.6% for the season. That was 13th overall in the NHL. They had 2,353 face-off wins compared to 2,511 losses, meaning their face-off win percentage was 48.4%. That ranked them 26th in the league. On defense New York had 1,715 hits and they blocked 1,244 shots from the opposition, putting them 8th overall. Toronto had a Corsi percentage of 50.1% as they tried 4,980 shots on goal while at full strength while they surrendered 4,965 shots on net when they had a full team on the ice. That ranked them 20th in Corsi percentage. They were 20th in the NHL in Fenwick percentage with 49.7% as they had 3,758 shots while they gave up 3,799 attempts on defense. The Maple Leafs started possessions in the offensive zone 50.2% of the time while their defensive zone percentage was at 49.8% for the year. That put them 19th and 14th in the league in zone percentages respectively. They had 2,523 face-off wins as opposed to 2,531 losses, meaning their face-off win percentage was 49.9%. That was 16th overall in the NHL. On defense Toronto had 1,936 hits and they blocked 1,166 attempts from opposing offenses, which was 14th in the league. Who will win tonight's Rangers/Maple Leafs NHL game against the spread?